Looking for a November nightcap? 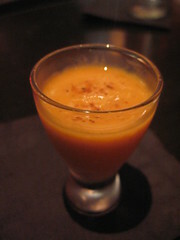 Finlandia grapefruit vodka, spicy pumpkin puree, condensed milk and garnished with nutmeg. 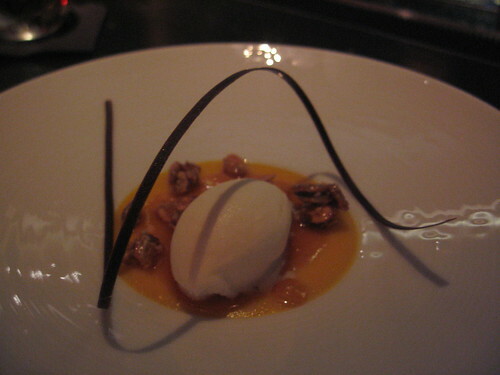 The coconut/caramel ice cream was so delicious with the Kabocha creme and the crispy carmelized seeds gave it good crunch. But the best part is actually the shot (have a little sip with each bite you take), which finishes off the dessert in a whole other way. Yes, it’s made with grapefruit vodka so there’s a nice, refreshing base while giving you that autumn, savory creaminess you’ve come to expect from pumpkin pie. 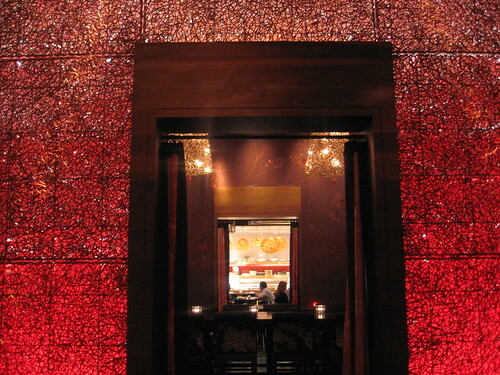 One thing’s for certain – I have my eye on the foie gras wagyu gyozas! I think I may just have to stop in – dessert’s just not enough. This entry was posted in Food, West Hollywood and tagged dessert, dessert shot, Japanese tapas, La Cienega, Nobu West Hollywood, November, pumpkin, shot, West Hollywood. Bookmark the permalink.